The central Indian state of Madhya Pradesh has a versatile tradition of hand-block printing, located in several distinct centres. The distinctiveness and particular style exemplified in each of the several centres has evolved gradually, incorporating within in a combination of the culture and tradition of the specific area, the raw materials that were and are locally available, and of course the artisans’ design aesthetics. Each centre retained its uniqueness till fairly recently – traditions were deep-rooted, distances vast, communication networks weak, and the mineral-rich waters that facilitated and added to the colours unique to each area. This living tradition has resulted in a vibrant variety of prints in a wide design range. Distinct among the block-printing techniques and designs are those from Bagh and Javad. Other traditional hand-block printing areas include Ashta and Sehore in District Sehore, Narsinghpur in District Naroighpur, and Khairola in District West Nimad – however, these centres are more or less extinct now due to the overall decline of hand-block printing, owing to competition from screen and mill prints. Bagh, which lends its name to the Bagh prints, is a small tribal village/ town in the Kukshi tehsil of Dhar district of Madhya Pradesh. Legend has it that the village of Bagh, the Bagh river, and the nearby Bagh caves (3rd & 5th century AD, with rich carvings and paintings dedicated to both Hindu as well as Buddhist deities) got their name from the baghs or tigers that inhabited the region. The village, located on the Dhar-Kukshi road, has a population of about 12,000. The Bagh river flows at a distance of about a kilometre from the Dhar-Kukshi road. Village elders point out that, earlier, a Devi temple was considered to be the mid-point of the village. However, with the increase in population, the village has spread remarkably. The change is fairly recent: Haji Suleman Khatri himself remembers Bagh as a small isolated village, some decades ago. Bagh village has some historical sites within its boundary: an old stone fort atop a hill, visible from the whole village; and an old temple – Mahakaleshwar – that is along the banks of the Bagh river. The temple is in ruins, with only the sanctum portion intact to any degree – the ceiling of the sanctum though is a recently made one. The temple – made of solid stone blocks and rich carving – seems to be very old. The deities, it seems, have been installed recently. There are no records to help trace the history of the fort or the Mahakaleshwar temple; even the local people have no idea of their origin. The modern village of Bagh is a busy kasba (block) during the day-time. Traffic movement along the Dhar-Kukshi road is heavy. This road links this region to the towns of Indore in Madhya Pradesh itself (160 km away) and Vadodara in Gujarat (190 km away). A busy bazaar on this road fulfils the daily requirements of the villagers. A village haath is organised on Mondays in Bagh, on Tuesdays in Kukshi, on Wednesdays in Bari, and on Fridays in Jobat. Bagh boasts of a government school, a residential school for both boys and girls, a few private schools, a health centre, and a Government of Madhya Pradesh Handicrafts’ Department. Bagh village has a majority Hindu population; however, there is a sizeable Muslim population also. Adivasi tribals (counted among the Hindus) inhabit the surrounding areas. Among Hindus, there is social stratification among the Brahmins, Jains, Gaulis, bhils, and bhilalas, with social interaction being limited. Even among the Adivasis, the bhilalas consider them to be ‘of higher origin’ in relation to bhils – thus the bhilalas do not accept food from bhils. Among the Muslims can be found Khatris, Mewalis, Pinjaris, Mansuris, Pathans, and Shahs. Though no overt stratification exists among these, yet inter-marriage between groups is socially prohibited. Women in Bagh, it seems, are confined mostly to indoor activities – Adivasi women, however, work outside of the home. Economic activity in Bagh village can be assessed from the presence of two cement factories and the ongoing mining and quarrying work in neighbouring areas. Rain-fed agriculture leads to surplus labour, which is engaged in neighbouring towns, and in mining and cement manufacture and other similar works. The block-printing workshop established by Ibrahim Khatri and Ismail Khatri, employ some local villagers and Adivasis. The khatri community, who comprise the chhipas or printers are believed to have come to Bagh – about 400 years ago – from Larkana is Sind, which is famous for its Ajrak prints. What motivated these families to cross the capricious Indus and settle in the interiors of India, far away from their ancestral homes, is not known for sure but what is certain is that they carried with them a strong tradition of hand block printing. A case study was made of the family of Haji Jumma ji Khatri (Angare), which is known to have carried on the tradition of block printing with vegetable dyes, even though Haji Jumma ji Khatri passed away years ago. His sons have kept the tradition alive. Out of three of his sons, two of them, Suleiman and Ibrahim – along with their own sons – are engaged in the same occupation. Both Suleiman and Ibrahim, though born in Manawar and Rajgarh respectively, have been in Bagh for the last 40 years, as per their own estimates. Ibrahim Khatri and Ismail Khatri had similar stories (with a few variations) to tell with regard to their settling in Bagh and the origin of Bagh prints. Khatris are supposed to have moved out from Sind in the medieval period. They settled down together in the Marwar region, after which they moved in different directions, depending on avenues for economic advancement. Khatris in good numbers, converted to Islam after coming under the influence of a sufi saint. Ismail Khatri stated that his ancestors moved out from Sind due to the terrors of a Brahmin raja there. They settled down in Pali (near Jodhpur, Rajasthan). A disastrous famine forced them to move to Gautampur in Malwa region. It was when his grandfather was six months old and when the new railway line was being built in Gautampur that his forefathers moved out from Gautampur to Manawar in Nimar district of Madhya Pradesh. Famine was the reason for the move from Gautampur to Nimar. Suleiman Khatri (b/o Ibrahim Khatri) stated that his forefather settled in Kukshi tehsil of Dhar district. It was from Kukshi that his grandfather/father went to different places like Manawar, Raigarh, and Bagh to sell their hand-printed textiles. During the partition of the subcontinent in 1947, his grandfather and uncles left for Pakistan (Karachi) while his father (Haji Jumma ji Khatri) stayed back in India. As Ismail Khatri points out, it was 40 years ago (1962) when – owing to persuasion from the mahajans of Bagh – the his father (and uncle) decided to settle down in Bagh – the name Bagh print came into existence. The quality of the water of the Bagh river further helped in their settlement in the Bagh village. The geographical location and its population increased the sale of their prints. The Khatri family under study has established its name and is reasonably satisfied with its occupation. Both Ibrahim Khatri, who is the head of the family, and his wife have been given due recognition by the state and central governments. The government has honoured them for their workmanship and has also provided them a piece of land and built a workshop there as an incentive for them to continue this tradition. The success of the family in this business can be gauged from the fact that they have stayed together as a joint family and have common kitchen despite having another small house of their own a few yards away. They prefer to remain together and are willing to put their children in the same occupation. Their family is amongst the better-off families in the town and all their children of school-going age are getting formal education. They want their children – including the girls – to study as much as possible. The division of labour in the Bagh printing is simple and along fairly traditional lines. The work is done mainly by the male members of the family. They are assisted by male labourers drawn from socio-economically backward communities. Most of the labourers are from bhil tribe, perceived to be at the bottom of social hierarchy in the region. The women in the family, through aware of the technology involved in this type of printing, never participate in the printing; they almost never visit the workshop either. In the workshop that was studied, there are 16 karagirs /craftspersons/ workers – of whom one is a woman – and one masala maker. On the shores of Bagh river work 10 mazdoors /labourers (all of whom are tribals). One tribal who works in the workshop also works as the watchman at night. His own house is nearby and he spends his night at the workshop. For protection he is equipped with a bow and arrows. The nature of work at the workshop is different from that at the river-side – the work at the river-side is less complicated but requires more energy and stamina. The labour in the workshop is expected to be more skilful, diligent, and patient, since block-printing requires a stable hand and the capacity to sit and work for hours together. Within the family the brothers have divided and distributed their share of job in the printing process. They themselves do not participate in the process of printing – their role is supervisory in nature. Through all the brothers know all of the processes, they hardly ever work along with their labourers. The eldest, Ismail, fetches all the raw material, while Mubarik decides the type and pattern of the design. The selection of designs is influenced by market trends. A lot of innovation is involved in creating patterns that are a judicious combination of traditional and new forms. Though the effort is to preserve traditional design elements, yet a fair amount of new design ideas have been incorporated. Mubarik has not gone taken any design course but has developed a knack for designing, picking up from the traditional knowledge that he inherited from his family. Their first cousin Farooq takes care of all the activities on the river-shore, and the youngest brother, Yousuf, co-ordinates all the activities at both the ends. Whenever there is a need, all brothers aid each other in meeting their production targets. The work done at the river-side, that of washing clothes, commands less respect than that done at the workshop. This perhaps explains why only tribals are employed at the river-side. This could also be the reason why the son of the younger brother is supervising the work involving less skill. It appears that the eldest brother has got the highest prestige as he decides and arranges all the raw material; the youngest, though seemingly co-ordinating all the activities is, in practice, assisting anybody who requires help. He has lesser role to perform in decision making. The lifestyle of Khatris is much more modern than that of their labourers. They have got two fully constructed cement houses, one of which they use as a store and a guest house. They were contemporary outfits like trousers and shirts. The average wage rate of labourers in the workshop is (Rs 110/-) is a bit higher than the wage-rates of the labourers performing on the river-side (Rs 80/-). No labourer goes against the decisions made by their employers. Every single process in Bagh hand-block printing is manual. Even the cotton saris are hand-printed. Each sari takes a minimum of three weeks to complete after the design is printed. During this period it is washed in the river at least seven times and sent to the bhatti at least twice. Two persons stand knee deep in water to wash the fabric/sari so that superfluous colour is removed without touching any other part of the printed surface. The fabric/sari is boiled in a cauldron of water on a bhatti – with regulated heat – to allow the correct colour to emerge. This is a painstaking process and has to be executed with utmost accuracy, care, and skill. The cloth – mainly cotton and sometimes silk – is usually bought from the market. The fabric used by the Khatris may be Bangalori silk (bought from Indore), cotton or grey latha (bought from Indore and Bombay) or silk-cotton mix (bought from Maheshwari in Khargoan district). Silk needs much more delicate handling and care; generally a silk cloth takes almost double the time for its completion than does a piece of cotton cloth the same size. The cloth is taken to the river where it is thoroughly washed. According to Amar Singh Chauhan: 100 single sheets are washed at one time – that is, 250 cuts of fabric 60″ wide. The fabric is soaked in water for 2 hours. It is washed by beating it on riverside stones several times. It is brought back to the workshop after drying. According to Ismail Khatri, the fabric is soaked for just over an hour, and then beaten on a stone slab to remove the starch, before being washed in clean water and dried. The cloth is brought back to the workshop, and dipped in a particular solution for an entire night, after which it is put out to dry by spreading on a floor of stones out in a verandah. A solution of 3 kg of sanchara (rock salt) soaked in 15 litres of water, stirred till it melts. 10 kg of mengni soaked in 10-15 litres of water. When it is soft, it is made into a paste by grinding it with a brick on a stone surface. 1 kg of arandi ka tel or unrefined castor oil. The three are mixed to make a dhaul solution. The fabric is immersed in this water – it is to be kept under water for the whole night. The fabric is then taken to the river and washed in flowing water. Then it is dried. This process has to be repeated three times; each time the fabric has to be kept in the water for 10 to 15 minutes. By this time the material becomes quite soft. It is cut into manageable pieces. 4 kg of sanchara soaked in 10 litres of water and made into a paste. 10 kg of mengni, soaked in 15-20 litres of water, softened, ground on a stone slab with a brick and made into a paste. 2 kg of arandi ka tel. The arandi ka tel is mixed with the sanchara and stirred till it curdles and turns into a paste. The paste made out of mengni is then mixed with the solution. All this is mixed with water till there is about 50 litres of the mixture in the vat. The fabric is soaked in this water till it is completely wet several times over. Its then kept in the vat and pressed hard by several men – with their feet – for about half an hour till it softens. Treating the cloth with harara gives an off-white or off-yellow background to the cloth and also aids in strengthening the tones of the black and red colours that are printed later. According to Amar Singh Chauhan: On the day after mengni karna the fabric has to be treated with a solution of harara powder (the alternative, bahera is not used because it gives a blackish tinge to the fabric). About 10 kg of harara powder is soaked in 25 litres of water for half an hour. Them about 20 litres of plain water is mixed with 10 mugs of harara-water solution. According to Ismail Khatri, 15-20 kg of harara is soaked in 20 litres of water. The fabric is dyed by keeping it in this mixed solution for 10 minutes, after which it is dried. In processing the second lot, four to five mugs of the harara-water solution is added, the cloth dyed in it for 10 minutes, and then dried. Thus the total quantity of the fabric is dyed in about ten lots, repeating the same process each time. According to Ismail Khatri, when dried, the fabric turns yellowish. According to Amar Singh Chauhan: Iron sulphate (used for making black dye) or alum (used for making red dye) is soaked in a container of water. The proportions are: 50 grams of alum to 1 litre of water (the quantity of alum can increase to 60 grams in the rainy season); and 50 grams of iron sulphate per litre. The mixture is given a boil and kept in the container for eight days (according to Ismail Khatri, ten days). After that, chiyan (tamarind seed) powder – which is now a substitute for glue – is mixed into the alum or iron sulphate solution. A paste – the right consistency for printing – is made. If more colour needs to be made, the pre-mixed alum or iron sulphate water is used. At this stage the cloth is meticulously and patiently printed by hand with the help of small design blocks. The designs are transferred very neatly on to the cloth. The time taken depends on the design and pattern, though, on an average about 5 metres can be printed by an expert worker in two to three hours. According to Amar Singh Chauhan: The fabric is printed upon using the hand-blocks. The fabric is dried before being folded. It is kept for a minimum of eight days and a maximum of two weeks for the colour to be absorbed properly by the fabric. According to Ismail Khatri: Trays with colour are covered with a bamboo frame called a kartali. On top of this a felt piece is kept through which the colour is picked up by the portion of the block that has to be printed. The rest of the block is filled with coarse felt – this is called naman. The printed material when dry is rolled into bundles and kept away for eight to fifteen days. This allows the colour to set in properly. According to Amar Singh Chauhan: The next part of the process – bichalna – involves taking the printed bundles to the river. The printed material is pushed into the water and taken out swiftly so that the extra colour is removed and flows into the river water. This process requires a lot of strength – two people stand in this running water and hold the fabric with their hands firmly, while ensuring that the fabric is under water most of the time. Each piece needs to be kept under flowing water for at least 20 minutes. It is then held over the shoulder and beaten against stones so that all the residue is also removed from the printed fabric. According to Ismail Khatri, this process requires a lot of care and strong muscles.) If this process is not followed correctly, stains and smudges can appear on the printed surface. These are permanent and cannot be removed except by pota, which involves painting the whole surface in black or red by stretching the fabric and painting it with a rag tied to a stick. Ismail Khatri states that if there is no water in the Bagh river, the material has to be taken to the Narmada river, five hours away in Chikalda. After being washed thoroughly, the cloth is taken back to the workshop where it is boiled in a solution of dhavda ka phool (for shining and fixing) and alizarine (to fasten colours). After the boiling process, it is again dried. According to Amar Singh Chauhan: Big vats are filled to the brim with water. (The vats are large enough to allow 25 single bed covers to be soaked in them at one time.) The vats are generally made of copper and are fixed on brick and cement furnaces. About 1.5 kg of the dhavda flower is added into the water in the vats. This is allowed to heat for a while. A potli (cloth bundle tied securely) of 150 grams alizarine is made and is squeezed into the hot water which has a fire burning under it. According to Ismail Khatri, 2 kg of dhavda flowers and 1 kg to 1.25 kg of alizarine is added to it. The cloth is put into this hot water solution of dhavda and alizarine – it is important that the cloth is shifted and turned constantly, using long wooden sticks. All this while, the heat of the water solution in the vat has to be increased by adding more fire wood in the furnace. It is during this process that the colour of the prints develop – the workers know from experience when to take the fabric out of the vat. The fabric is then rinsed in clean water and spread out to dry. According to Ismail Khatri, eight people work on a bhatti for six hours and 2 to 3 quintals of wood is required. After drying, the cloth is taken to the stream where it is washed three to four times. This process is also called tarai: after washing the cloth, when it is being dried, it is repeatedly moistened by spraying water on it with the hands. This helps to gradually set the colours permanently. (Sometimes, to save time, a bit of bleaching powder is added in a drum of water and the cloth is passed through it. This obviates the need of washing the cloth three to four times.) The washing of the cloth in the stream at this stage again is done very systematically. It requires two to three persons to wash one piece of cloth. After dipping the cloth in water, one person pulls it in one direction by paddling his hands in water so that water may run through cloth with force; the other two try to keep the cloth beneath water. This is an arduous job. According to Amar Singh Chauhan, in the bleaching process, about 5 kg of bleach is mixed in 50 litres of plain water. Then about two mugs of the bleach solution is added to 30 litres of plain water. According to Ismail Khatri, 2 kg of bleach is mixed in a vat full of water for the process. The fabric is dipped in the bleach, washed quickly in the river and dried. After a few pieces have been dipped into the bleach mixture, more bleach solution is added to the water, in a continuous process. According to Amar Singh Chauhan: Sometimes, if the colour is not as bright as it should be or it is required that two shades of the same colour show up separately, over-dyeing is done. Harara, and 5 kg of alum (if red is required) or 5 kg of iron sulphate (if black is required) are boiled in 10 litres of water. Two or three pieces are then dyed at a time and dried. After two days, these are taken to the river again for bichalna – as the material is held by two people and tossed and washed in the river the flowing river water drains away the excess colour. The process of bhatti is repeated, after which the pieces are will be taken to the river, washed and dried. The blocks used for stamping are intricately and deeply carved by block-makers in Pethapur in Gujarat. The design repertoire of Bagh prints covers geometrical and floral compositions. Bagh layouts are dramatic in the use of black and red alternately on a white background. Ismail Khatri remembers his father making different prints and even different clothes for different communities and castes like Brahmin, Harijan, Bhil, Bhilalas, Jats, Bharur, Mahajan etc. He remembers that even Khatris used to wear particular clothes with specific prints. However now none of this differentiation remains. Expect the Adivasis (that too only for particular occasions), all buy all types of prints and fabric. The printing is done with vegetable colours, derived from plants, fruits, flowers, and minerals. Ismail Khatri claims that there are only four basic (natural) colours: red, black, khaki, and indigo. He says that he can lay a bet with anyone who says that there is a fifth colour. The black colour is prepared with ferrous sulphate mixed with tamarind seed powder and glue, which is cooked in water and stored for use. The red is similarly produced from alum. In the case of grey, the printing is done with hirakayisha (earlier made of iron rust; now bought from the market) for developing the colour, the cloth is not boiled but is passed through a chalk solution/lime solution (chune ka paani ka dhol). If a grey tone is being created, hehra powder is not used. It is when these colours are boiling with dhavda flowers and alizarine that the dramatic colours associated with Bagh prints are revealed. More colours – like blue, ochre and salmon pink – have also been introduced with the use of indigo and anaar ka chilka (pomegranate skin). Other colours can be made, by using different natural commodities and by using differently the materials used in creating the four basic colours. Shades can be obtained by increasing or decreasing the material (colouring) used by varying the ratio of different material used. For example, increasing or reducing the quantity of hirakayisha, several shades can be created; alum can be varied to produce different shades of red. 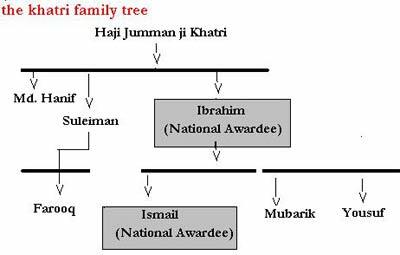 Suleman Khatri and the sons of Ibrahim Khatri explained the entire process. Any material like hirakayisha or alum has to be first made into a paint-like solution with imli ka chiya (seed of the tamarind) to make a paint like solution. Hot water is added according to the required density of the paint/print solution. Generally enough a colour is made once – in the morning – for the entire day’s requirements. However, if needed, colours can be made any time. Alum is colourless – it produces red when boiled with alizarine and dhavda ka phool. Earlier, the root of the aal tree (aal ka jad) was used as a fastening agent; now alizarine has taken its place. Alum absorbs colour on boiling with solutions made of colouring matter. Thus, if a cloth has to be dyed green, grey, khaki, yellow, or any related colour, first block printing is done with alum, which is a mordant, after which the colour is retained by dipping the cloth in the specific solution for about a day. Since alum is colourless, to enable the block-printer to gauge his print during the printing process, a simple colour (chemical) colour is used; however it is only after alum absorbs the colouring solution in which the cloth is dipped that the desired colour becomes apparent. Alizarine and dhavda ka phool are used as a resist-dye or to make the colour pukka (fast). In fact, alizarine makes red and black fast colours, while dhavda ka phool gives them a shine. Colours from anaar ka chilka and haldi (turmeric) are made after boiling the material in water for several hours and filtering the solution. Some of the materials like dhavda ka phool and the keshavri flower are available in local jungles; the rest have to be obtained from the market in Indore. A process called DOUBLE DYE has been developed by Khatris, to make their product more competitive in the market. Here the cloth is printed with colour combinations or with imposing two similar colours, to produce a different variety. In this process, ‘lal per lal‘ (red on red), ‘lal aur kala‘ (red and black), and ‘lal aur khaki‘ (red and khaki) prints can be made. In this method either the processing of one colour is done before the other or processing of both the colours is done together. Akadu I Grey Light Grey hirakayisha No need to boil in Alizarine. Instead cloth to be dipped in lime + water. Gehra Peela Deep yellow Added colour to become visible while printing Keshavari flower + Alum Process like in yellow for (i) specific part of cloth & (ii) for entire cloth. Ratnajoth Green Added colour to become visible while printing Ratanjyot + Alum Process like in yellow for (i) specific part of cloth & (ii) for entire cloth. Khaki Wood Added colour to become visible while printing Anaar ka chilka + Alum Process like in yellow for (i) specific part of cloth & (ii) for entire cloth. Bagh printers use a number of implements in their printing process. These instruments hold a specific significance for the printers, a means of their roji-roti (daily bread) and are sometimes an object of worship. The second type of blocks, which are cheaper, are made of two pieces of wood. The holder wood is attached to the printer wood by two screws. The advantage with these blocks is that the handle can be manoeuvred to change position, in different positions of printing. The Khatris in general prefer the first kind of blocks due to their long lasting nature. Blocks are generally made of good quality wood: sagavan wood from Balsar (Gujarat) and good quality shisham from Farakkabad (Uttar Pradesh). The Khatris get their blocks made from Pethapur in Gandhingar. Earlier some old Khatris in Kherala in the Khandwa district of Madhya Pradesh made blocks. Now, however, the person who used to make the blocks has stopped doing so because of his age; owing to limited returns and markets, none of his sons learnt the profession, Some Muslim chippas in Indore used to make blocks – however, now they have taken over to making government seals and stamps. Some block-makers are still present in Ujjain; however, the Khatris do not get their work done by them, due to their inferior workmanship. Blocks of superior quality are finely carved wood-base with holes on top or sides to release air during printing. Patas (plain) blocks, especially require these air opening. (However, some block do not have these holes, as these are not mandatory.) To make the printing surface of the blocks smooth, a piece of cloth is stuck on the patas (plain) blocks, in other design blocks, wool-piece are stuck on its face using the takla. The Khatris have thousands of blocks with them, which they have inherited from generations. Some blocks are broken or not in use, but they never throw their blocks. The old blocks that are either not in use, or not in regular use, are kept separately on racks. Blocks are cleaned with brushes and considerable attention is paid towards their proper upkeep. In the Ibrahim Khatri family, Mubarik does the basic designing for block-making. He gives his idea to the block maker, who in turn make a design on a transparent piece of paper. If approved by Mubarik this designed is carved on the wood by the block-maker. A block may cost from Rs 600 to Rs 3,000/- depending on the quality and fineness of the work. A block in regular use may last only for 3 to 4 months; otherwise if may last for one or two years. Palea: Made from sagavan wood, this is the container in which the colour is kept before the printing process. Bas ki kartali: Made from bamboo, this is a flat object kept in the palea and floats in the colour kept in the palea. Jota: Made from wool, this is a thin flat beaded object that is kept on the kartali. The printer, while printing, keeps the block on it, so that only appropriate amount of colour comes on the block. Farsi: Made from red sandstone, this is a special table on which the chapai or printing work goes on. Old clothes are kept on it to make it suitable for smooth printing. Kunte: This is made of copper. Takala: This is a tool used to imbibe wool (namda) on blocks to make printing smooth. Sugada (Shikja): This is used to hold the block, while working with it using a takala. Rangchalna: Sticks of different used to move/rotate the cloth while heating. Galni: This is a thin piece of cloth used to filter the colouring matter to produce colours. Kadi: A piece of stick (6 cm) on which a cloth is tied. Wherever there are gaps in printing, kadi laden with colour is used to fill the gap. Traditionally, the colours, designs, and products of Bagh printing were integrally linked with the needs of the local nomadic bhil and bhilala tribals in the area (comprising approximately 80 per cent of the population). The products were, dominantly, odhanis and lugdas worn by the tribal population. Bagh textiles have had to adapt to meet contemporary urban demands, especially as the traditional markets no longer exist – the tribals have switched over to mill printed polyester blends that are cheaper and more durable. The fabric used originally was cotton, though now tassar, crepe, and silk are being used with excellent results. Bed-sheets: Of different sizes – like 90 inch x 108 inch (double); 72 inch x 50 inch and 60 inch x 90 inch (single). No specific designs are used for bed-sheets; however, most of them have borders. Table-cloths: Generally made in the size 60 inch x 60 inch; however size may vary from 30 to 90 inches. Both round and square table-cloths are made, using traditional and new designs. Cushion-covers: In different sizes – like 10 inch x18 inch, 16 inch x 16 inch, 24 inch x 24 inch, 30 inch x 30 inch (all inches). The design of cushion cover may depend on the table-cloth and bed-sheet. Pillow-covers: Generally made in the size 18 inch x 27 inch. Designs depend on the designs used in bed-sheets. Scarves: Can be made in size 1m x 1m or 1.25m x 1.25m . The designing or print is usually fine. Geometrical design like jaal and choukari are preferred. Saris: In sizes 5.5 m x 45 inches or 5.5 m x45 inches + 90 cm (if with blouse). Saris made nowadays carry a wide range of prints; however traditional saris worn by adivasis had only specific designs like janjuri, juardana, and beel, generally printed in red or black. Odhani or Lugdha Odhani: Generally 2.25 m x 60 inches. Lugdha odhanis are made specifically for Adivasi women folk. All lugdha odhanis have a similar pallu; however, the rest may differ. Lugdhas are of four types. Lehriya Lugdha: 2.25 m x 60 inches. These are made in both red and black. Generally they are dyed in plain colours, with no designs on them. Pomcha (Red): 2.25 m x 60 inches. 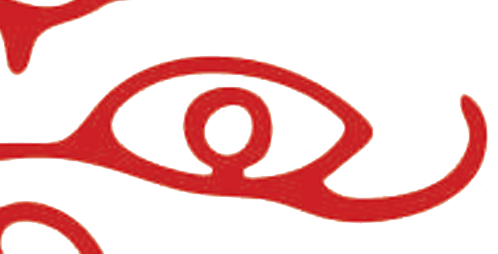 This is a specific form of the lugdha, with black borders and a red interior. Pomcha (Black): 2.25 m x 60 inches. This is a special form of the lugdha with red borders with a black interior. Jagam: A type of carpet – of thick fabric – made in different sizes by bagh printers. These are bough by an elite clientele. Besides, the above-mentioned products, Bagh printers make other items based on demand and cost of production, including sofa-cover, suit-pieces, shirt-pieces, quilt-covers, and handkerchiefs. WHAT MAKES BAGH PRINTS UNIQUE? Farooq (s/o of Suleman Khati), who is responsible for river work, says that it is the water of Bagh-river which give particular colour to Bagh print. In fact, when the Bagh river dries up during the summer and he has to go to Narmada (40 km away) to wash the textiles, he finds that reds and greys do not come out properly. (The scientific reason may be that the Bagh soil has high contents of lime and iron, which act as cleansing and fastening agents). Mubarik (s/o Ibrahim Khatri), who is a designer says that Bagh prints are known for both designs and colours. Bagh designs are unique, as block makers are selected and they can set blocks according to specific designs only. Thus block-makers, he argues, are attuned to Bagh designs and help to preserve these. Moreover Bagh designs are natural and taken from nature. Mubarik however failed to answer a question as to what things in nature inspired his designs – he says that it comes naturally. Bagh prints are also considered particular also due to the material used. Due to its geographical location and climate, bagh printers get many of their colouring material locally. The abundance of things like dhavda ka phool, bakare ki learnti (goat excreta), babul, keshavri, etc. in surrounding jungles makes the print and the printing process, smooth and specific. The availability of water in Bagh is also considered important. Locals in Bagh say that the water-table in Bagh is comparatively very high to Kukshi, compared to neighbouring Manawar. Of course, critical to the particular traditional style and knowledge of Khatris make their work specific and unique. Their methods – the ratio of colour formation, their particular ways of printing and processing etc. – make their work specific and particular. Is responsible for procuring raw materials, etc.